Kerben Bella Gowder Over a period of time, I have listened to a lot of Badaga singers [some were as good as professionals] but the best in my opinion is KERBEN BELLA GOWDER who had a golden voice. I met him for the first time all most three decades ago. He could play harmonium, bull bull tara or ‘thambutte’ [drum] with equal elan, His greatest ability was to compose and render songs on the spot, some times suitably changing the verses to suit the occassion. He was a much sought after singer in any function, be it a wedding, savu or anniversary. Just with a couple of his colleagues accompanying on the thambutte [mathalam] and jalra [cymbals], he would sing while playing the harmonium. Sadly, no songs were recorded in any studio. His savu [sad] songs would bring tears streaming down even in the hardest of hearts. it is very amazing. really i am very proud to be badaga. all the badaga songs which i heard are very good..
i like the song sola gaye thannada very mch..
i just need it’s lyrics.. if anybody have please send me..
Can anyone suggest me why we were not included in tribes off nilgiris. I feel we were ashamed to call ourselves tribe. I have seen some tribe who have the same culture thhat we have . Especially the marriage rituals. They call these tribes as Gonds from the central India. I am proud of myself because I am a BADAGA…!!! Can anyone send me the song Ethanodunae from SINNATHA MANNU? HAPPY AND NICE TO SEE GOOD GOING. BEST WISHES. You want the lyrics for which songs? can you help me with lyrics of song “Sole Gaye”? Really proud to be a Baduga! Rocking Badugas. Na Badaga enthu hegudhuga appara perumey pattaney.I love Baduga culture. I am proud to be a Badaga.I want Badaga songs. Can anybody send them to my mail? I love badaga songs.Its amazing to hear Badaga songs through the web. it takes me to remember all those drama songs casted in badaga hattis..bella gowder is one among them…hatzzz off.. These badaga songs make my day…!! I am proud to be a Badaga guy. I love badaga songs so much and I used to hear songs like singariye, solagaye, dimathaka and so on. While hearing the songs I can’t do without dancing.And I love the sad songs. In my mobile I have only badaga songs:-). I am Happy to be a Badaga. Amazing to hear BADAGA songs. some sad songs I like very much, like MANASU BEETHA MAMANA HEENUGA…, OOMALLE HURU GAKKI, O ENNA PARUNAE , and many more….. Please add more badaga songs. BADAGA ALWAYS ROCKS. I am very proud to be a BADAGA….. 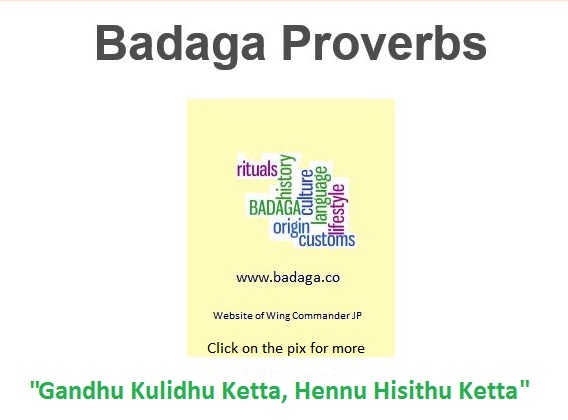 Proud to be a Badaga….Badagas always Rock. PROUD TO BE A BADAGA.I LIKE TO THANK ALL BADAGA PEOPLE WHO HAVE JOINED TOGETHER HERE. I love Badaga songs, always. I am very happy to hear our songs, but how to download our songs , please help me. Proud to be a Badaga. I have a request how to download badaga songs? Please go to http://www.preethsurya.com/bsongs. You can download it from there. Proud of being a Badaga…we have a great name in this world…lets keep it up…lets follow all our ancient customs till our death. Its a pleasure to hear all the Badaga songs through you tube with dance.People who are living in various place would like to hear our sweet songs which are the top most number among other songs.I would like to inform you that thiru Kerben Bellagowder songs are with me.Whoever wants these song please let me know.I will send the songs. Be puoud to be a Badaga and proud to an Indian. I am very proud to be a Badaga…..
being badaga means no tension I know what is life; we badagas are gifted people in this world…. If Illiyaraja hears the voice and song of Belli gowder, surly Belli Gowder would have been the top most singer in 80s. Now, he has passed away from us. 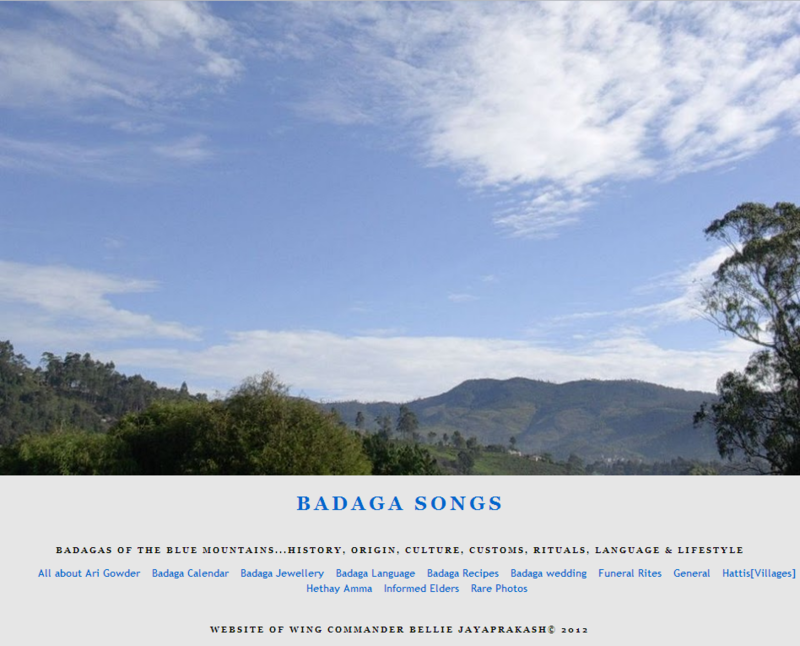 Legendary Baduga songs;born with name of Baduga;die wit name of Baduga. Baduga is my blood …..
You make it happen. I am proud of be a Badaga. I am expecting more and more improvement. I think this is possible. BARIVI ENNA ANNA THAMMARU, AKKA THANGAIYARU Nangendha nanga samoogava mundhuga etheendu oppo. badugas are gowders…. songs are very nice.. we created an big new community.. its very fine.. want to make a big history… i am sure.. i will do hard work.. but same time, many badugas are changing their religion… so want to be an hindu.. Hethai amma is there to keep well us.. i am proud to be a baduga always.. i love baduga..
i regret much for i was not born as a baduga. I came to know abt badugas only after 21yrs of my life, 2 yrs ago. And experienced their hospitality too. I give my whole heart to badugas. Really nice and thanks for the songs,dance and website informations. Excellent work…I am really happy and proud to see this website today. Congrats and great work….carry on. Great job. Congratulations.It was very nice to see our community details in web. My heartful thanks for this website and for these efforts. Am very proud to say BADAGA. very good job JP uncle…proud to be a Badaga. Saavira aalayu,nanga badugu paatu,badugu habba maake bandharava! Proud that im badaga.There are few dance numbers in badaga,which whenever we listen will make us feel like as if we are in a festival (habba). RajeshKumar UAE,Im sorry that i cant help you with the song you asked.But the singer is Mano(Tamil singer). I am proud to be a Badaga. I need more songs. Namashkara.The web has made the earth a very very small place, staying in UAE, it is always a pleasure in hearing such great songs………… but the negative, (they) make us feel home (hatty)sick…………… but a wonderful job by you JP sir….. hats off. Could anyone help me with the song oh mama adabali ……. … and may I know who has sung this song pls, ever green song? i am from badaga community. my brother indhran is the first film director [solaikuil,malaicharal, kathale nimmathi]from our community as well as nilgiri district. i am also a film producer. i have produced malaicharal tamil film. this is for ur kind information. Let us all work together to give script for our language so that it becomes a main language.. I m very proud to be a baduga..
Really very proud to see the website. Keep up the good work. Any help, pls contact us, we wil be there for you always. Proud to be a Badaga. Please send me the link for downloading badaga songs on the web. It’s an immense pleasure to see this web site, we should be proud to be Badagas, our hospitality, humanity & strength should continue for ever. Thanks for your hardwork in making this website…Its is a step ahead in making our strength and unity grow along with our culture. Keep continuing the good work. hi all badaga dudes..realy very happy to see your all comments and support on this community…really i feel very proud to be a BADAGA!!! Hello i am saranya from athigaratty.you have done a great job.I wish you all the best..
Its really amazing. My hearty regards to everyone. Your selection of songs is fantastic. solai gayi is amazing, njoy Ebbanadu guys. Thanks for your reply. I really appreciate you. You are doing good job for our community. I am trying somany time to download our songs But its difficult in ethioipia. can you possible to give another website. its truely a good one. I am very interest to listen our songs, I am living in ethiopia. Advise me to correct website to download – where I can get our favorite songs. Sivalingan from Tthambatty in Ethiopia. I am very interested in collecting the badaga songs albums of KBGA.Where can i get all songs? This is a great job, hats off to you. pls add more baduga songs with mp3 formate downloading options. Pls give the phone number & email id of mr. maga who is doing garments business in Tirupur. because i am also doing Textile designing in Tirupur. His contact is very usefull to me. I saw his details in comment in this site dated on March 18th, 2009 at 12:55 pm. 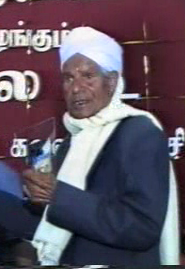 I need Shri Bella gowder’s (Kerben) songs like kara chennai and other very old songs. Cananybody help ? I am maga from Tirupur, I am really happy to visit our website. It’s very nice. I am doing export business and also doing some brand T–shirt in India , If you need any information or any jobs for our people contact us. HER NAME IS SAI PALLAVI! SHE IS JUST AN IMPECCABLE DANCER! Being a badaga, very proud of YOU.Keep it up for the community. பெள்ளிராஜ் மிகவும் சிறந்த பாடகராக வர வாழ்த்துக்கள். இது அனைத்து படுக இன மக்களுக்கும் பெருமை. படுகு மொழிக்கு எழுத்துக்கள் உருவாக்க அனைவரும் முயற்சிக்கவேண்டும். இதில் யாரேனும் முயன்றுள்ளார்களா என்பது தெரிந்தால் நலம். Namashkara. 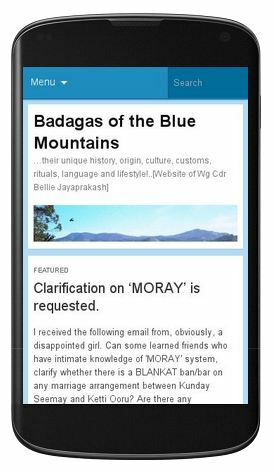 As I see most informative topics in this website regarding Badaga people and their origin, there is some information which states that badaga people belong to “Schedule tribes” and some leading organizations, for ex . Badaga association leaded by Dr. Kullan and others are fighting for the right . What is your opinion about this information . Can we Have a discussion on this so that we have input from various people? I am eager to hear our songs…. Thanks for adding my College Badaga dance video. It was our annual day function and all the dancers are Badagas. Also mlle_sumathi was looking for “moganodi,mathadi thinguva kanakathune “ song . Pls contact me ashok.bellan@gmail.com to get this song . I’ m looking for the song “moganodi,mathadi thinguva kanakathune “, any body hearing? Hi Sivakumar Bojan, nice to see someone from Ithalar which is quoted in 1 of the very popular badaga songs “aa Akka”. My mum is from Ithalar and most of our chidhood vacations were pleasantly spent in Ithalar. JP adds : I am clean bowled. I do not have the above song in my library. As soon as I get this, I will put it on the site. All the songs are very good and music is fantastic. All the songs are very nice. I like the song “MOGANODI MATHADI THINGUVA JENA ATHUNE”, can anyone send that song to my E -mail or from where i can down load that song. Amazing songs. Great to be a Badaga. Amazing,its nice to see our guys doing well. keep going. Guys you all have done a very good job.I hope in future there are more songs.All the three songs are very good and music is fantastic. We badagas should continue to live with harmony and strength. It is very amazing. because we have to show our strength to others . Please add some many badaga songs. Jena Jenagu Ninna Esaru Nilachira ..
Hethai Ammana Pathaga Enga Kanikke..!!! It was nice to see the information and of course of the music too.. I would like to get some of the songs which could be downloaded for the purpose of presenting the dance form in an school in Bangalore.. I would be very happy if you give the details. we really feel joy to hear Badaga songs.In cities we have no way to hear such songs.I wish you to continue your great work for Badagas.